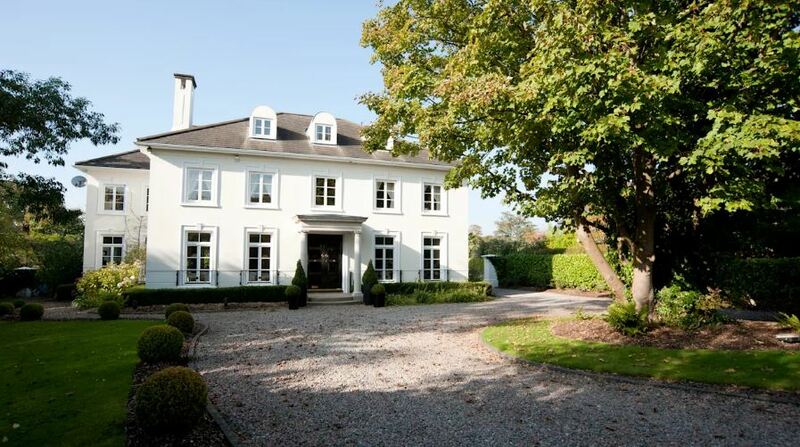 This luxurious 10,000 sq ft beauty is located in a much sought-after ‘Area of Townscape Character’. 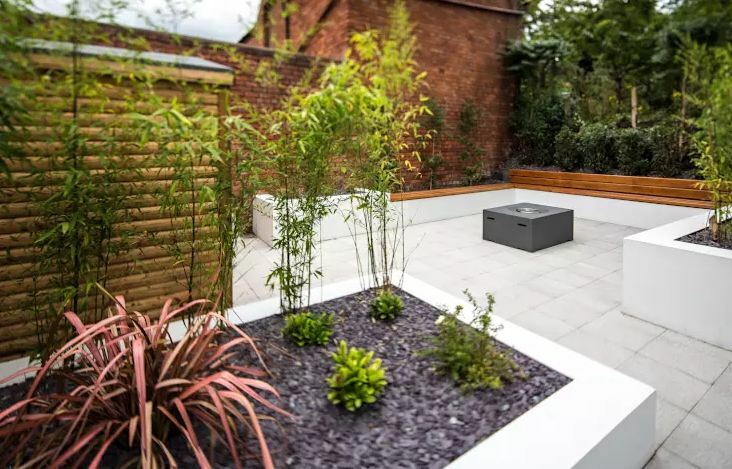 It stands comfortably in a site of half an acre with expertly landscaped gardens that respect the enforced Tree Preservation Order on the site. Sound good? Then let’s start exploring! Through cast-iron gates, we enter the property on which this dream creation is built. 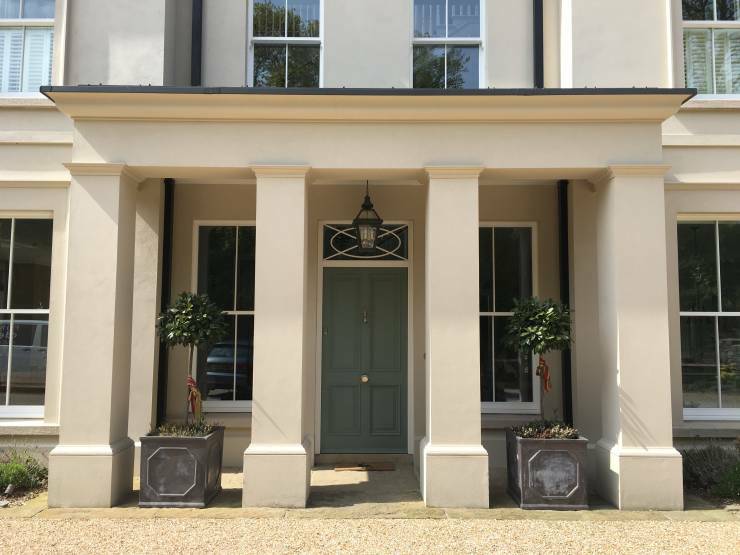 This bespoke home was designed with a formal, elegant yet simple entrance block, with a glazed sunroom to one side and a stone block to the other, looking like a converted coach house. The sunroom offers views to all aspects of the gardens while still ensuring adequate privacy for the family. 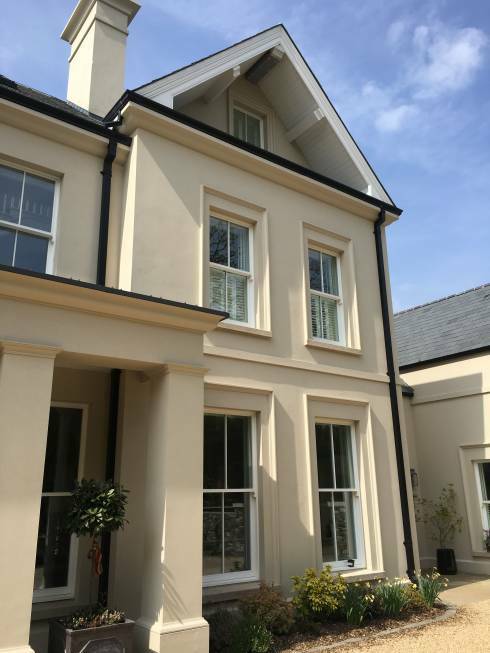 The neat smooth render is complemented by the fine painted hardwood windows and restrained granite sills. 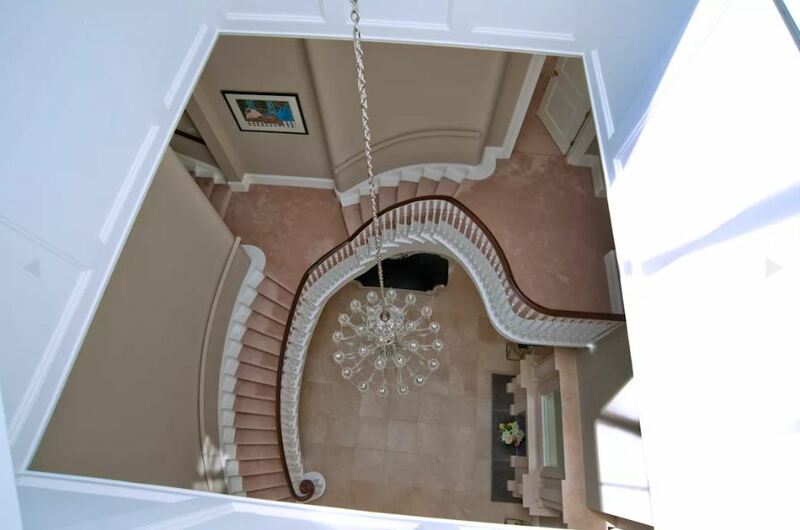 The finely detailed curved stair to one side of this impressive hall appears to just float in this space and is definitely calling out to be climbed. 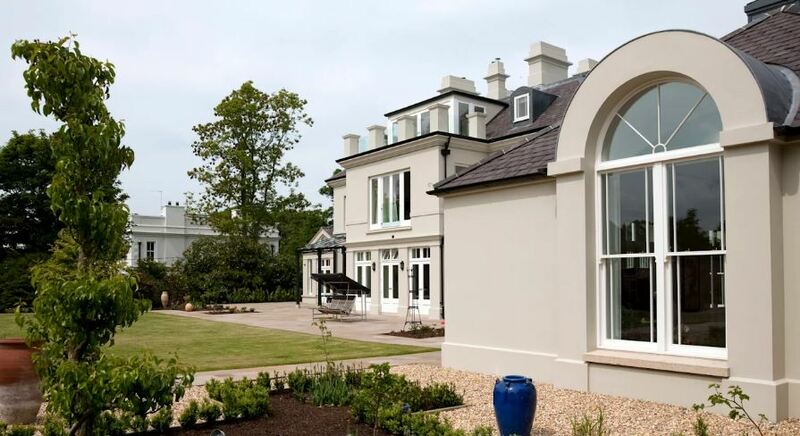 The formal rooms are positioned to flank the entrance, with the main living- and dining areas of modern living catered for and enjoyed towards the rear of the property. 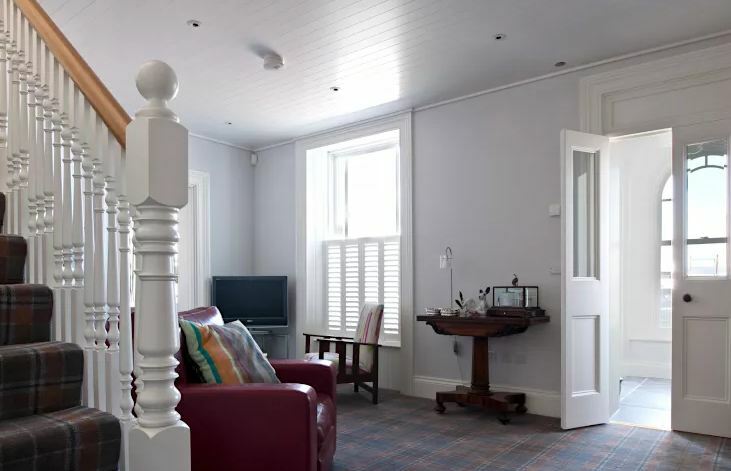 The upper floors, which are also bright and airy, provide voluminous bedrooms, en-suites and generous storage space. 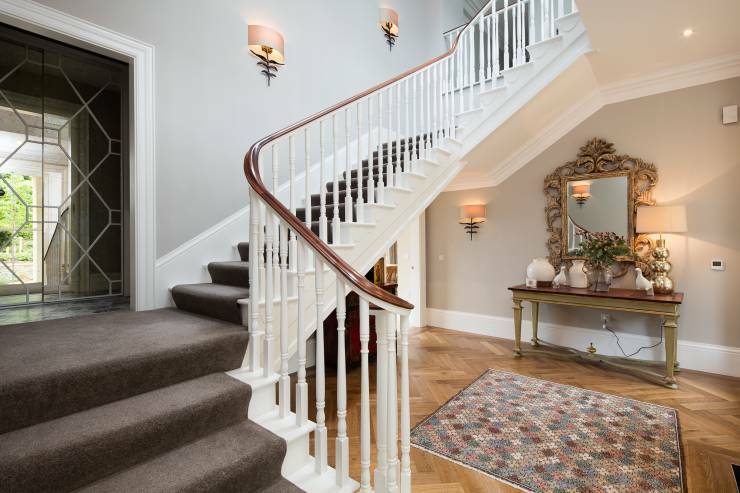 And thanks to ingenious planning and fabulous designs, each and every room you enter provides an incredibly bright and delicately rich style. 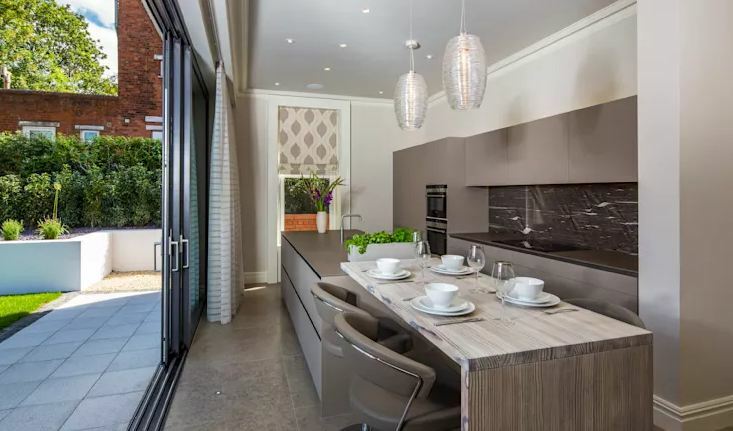 The main living- and dining areas overlook and open onto textured stone terraces, some offering shelter with lightly detailed glazed embellished steel structures. Allowing this visual link between the indoors and spacious outside definitely aids in allowing the interior areas of the house to feel even grander – not that it needs to, obviously. Let’s have a look at few more images of this delightful design. The structure we’ll be checking out? 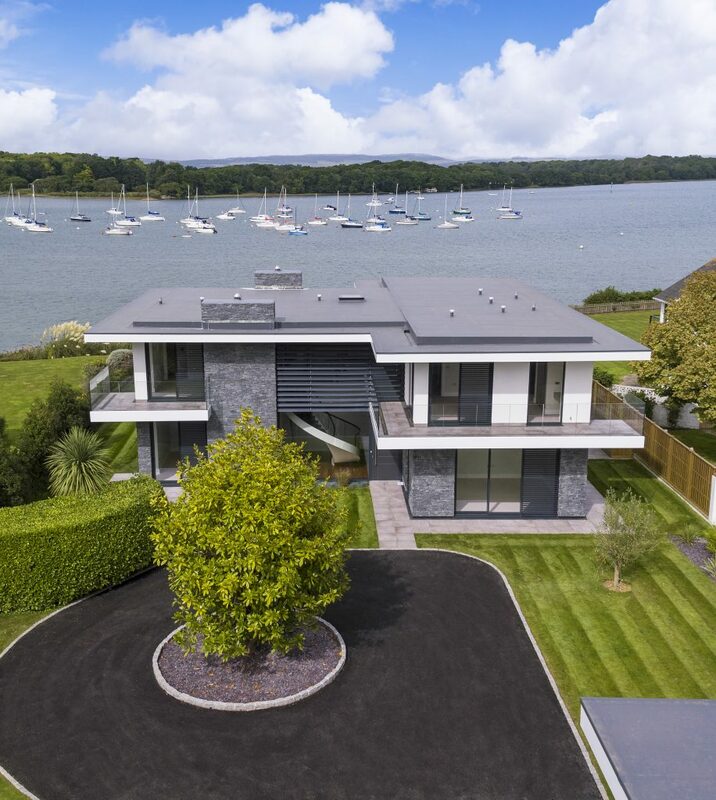 A most elegant family home that combines a formal exterior with a more contemporary free-flowing interior, built on a restricted site. For many, the word classical is synonymous with Georgian design, yet the experts in charge wanted to get away from a traditional Georgian style on this site. In fact, the results are closer to that of the Italian master Palladio than to anything British. 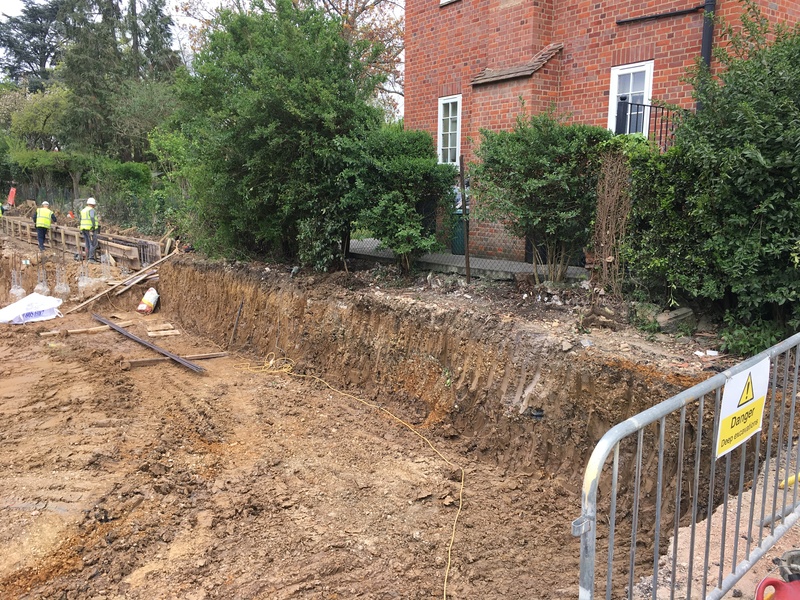 We all know the importance of first impressions, which is why professional landscape architect, Beth Moore, implemented a scheme to soften the impact of the house on what is actually a relatively small plot. At the front is a formal garden, planted with herbs and agapanthus, and hedging is being established to soften the boundary lines. The two mature trees on site have been retained and the semi-walled garden to the rear has climbers trained up it. The house’s unique design has been made so that there is very little circulation space; in fact, there are no long corridors anywhere, resulting in the usable living- and accommodation spaces being made the most of. 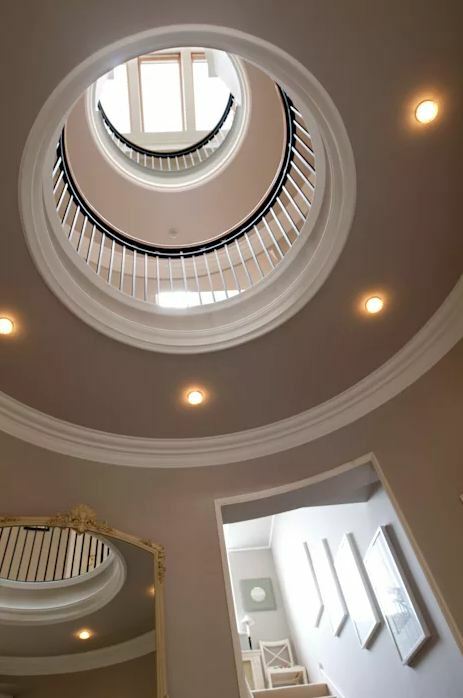 Here we get to stare in wonder at the circular atrium lit from above which forms central circulation space and lights up all three floors of this Italian-inspired mansion. The sloping site is reflected within the house by incorporating dramatic steps between rooms. In the kitchen area, these steps are used to create a visual break between the interlinked spaces such as cooking, dining, living etc. 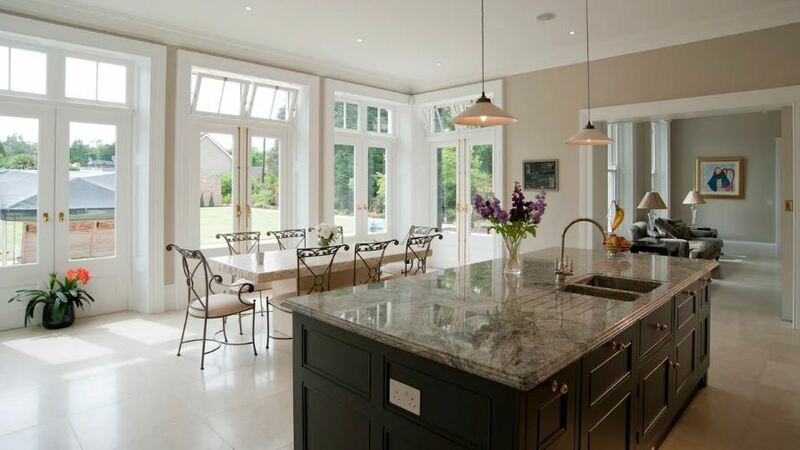 Although the structure itself flaunts a classic, elegant look, the furniture and décor pieces within the house speak of varied design styles, especially the open-plan kitchen and dining area, where country, classic and modern pieces can be glimpsed. And let’s not forget the delicate dose of colours and patterns which inject some striking character into the interiors! Let’s scope out a few more images, shall we? 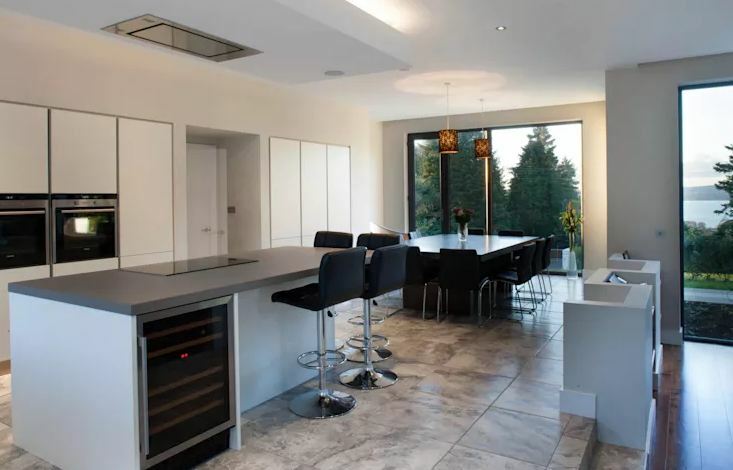 London team Des Ewing Residential Architects deserve a world of praise for this 418 m² creation that has become home to a family with five young children. The house is designed to be practical, durable and fun, yet also brings more than its fair share when it comes to contemporary cuteness! Walking past this house (or seeing a photograph of it) provides no single clue as to the magic included in its design. 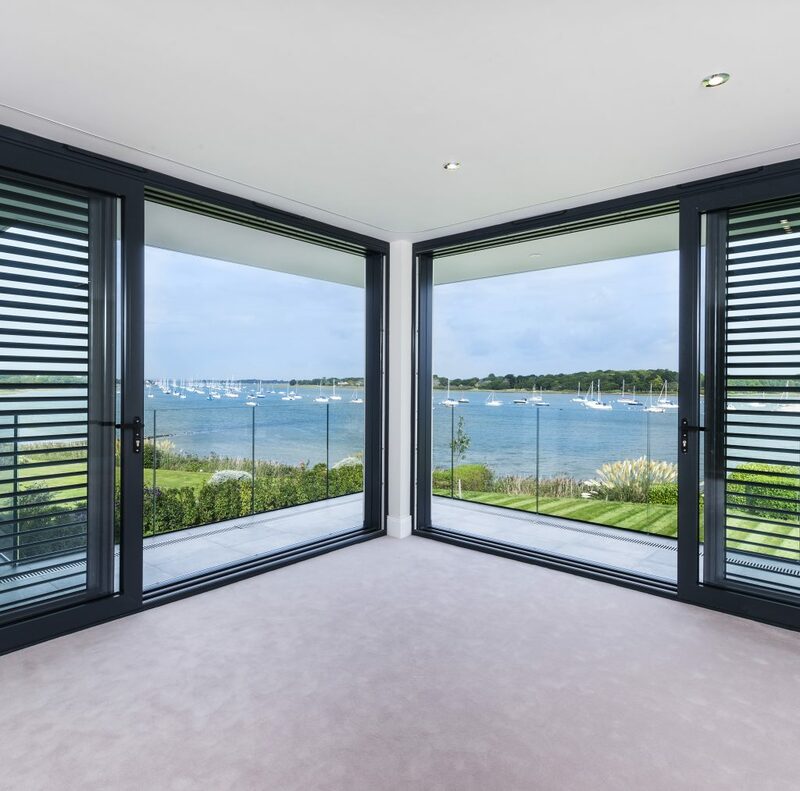 Yes, from the outside we can definitely appreciate its clean lines, high ceilings and extensive aluminium-framed glazing facing the views of the sea. 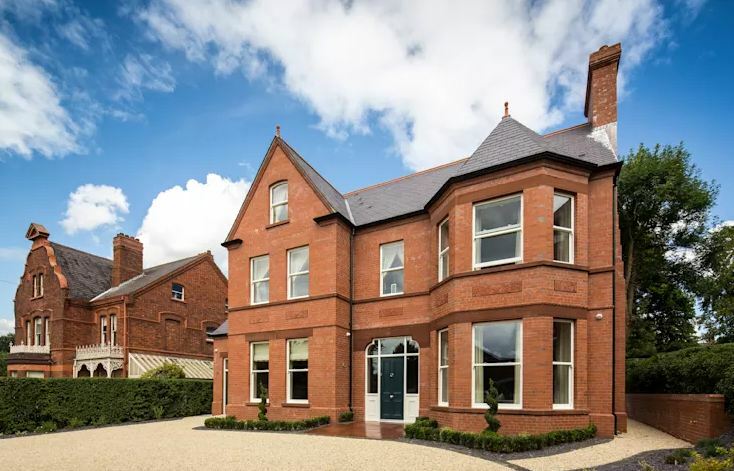 We can also write heaps about its monochrome colour scheme, how its natural green slate roof tops the white rendered walls with an olive green base and how it reflects the roof colour. 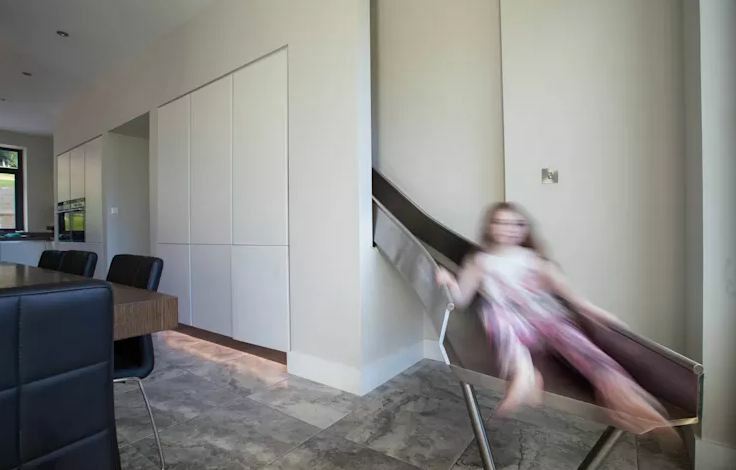 Even though teleportation devices don’t exist (yet), the designers of this house have developed another equally fast way to move the kiddies from their first-floor bedrooms straight to the kitchen table downstairs: this bespoke slide which definitely helps in ensuring everyone’s on time (and wearing great, big smiles) for school! But seeing as this is homify, a certain amount of mature style is required, so let’s focus on the aforementioned kitchen for just a moment! 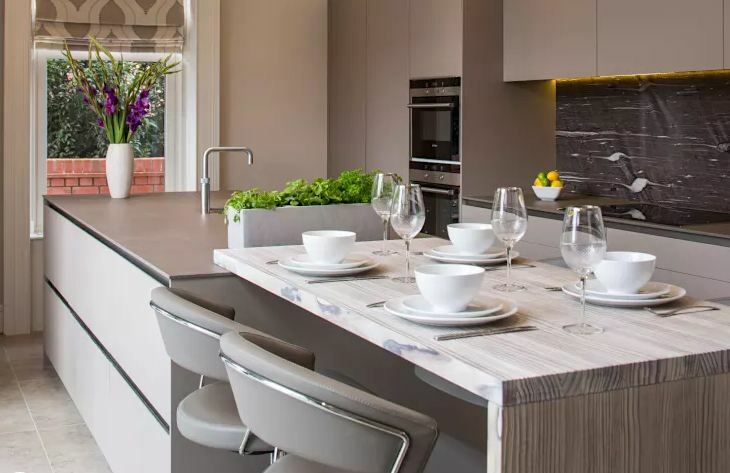 Flaunting sleek finishes, a linear design and a firm commitment to functionality, this two-in-one cooking- and dining space should be every modern-style lover’s dream design. And just check out the fabulous garden views and natural lighting seeping indoors. Right, back to the child-friendly designs that make this house one of our ultimate favourites! Although it can’t be seen here, a zip-wire through the wooded section of the garden continues the rapid transit theme (and is, of course, a bonus for keeping the kids entertained outdoors). 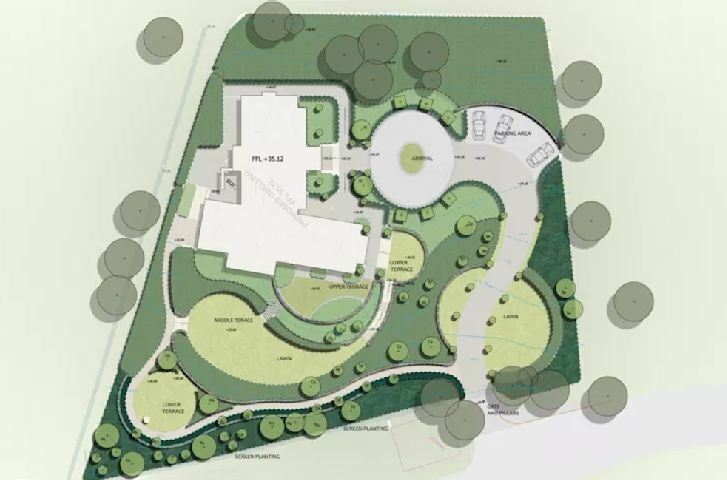 In addition, the zigzag, five-metre wide steps in the garden form a seated amphitheatre for the rear terrace, which also doubles as a basketball arena. 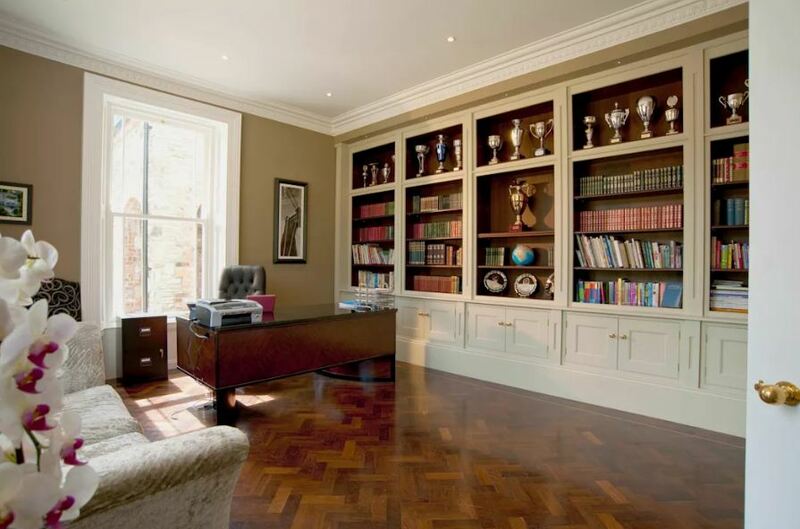 Shall we scope out a few more images of this house? 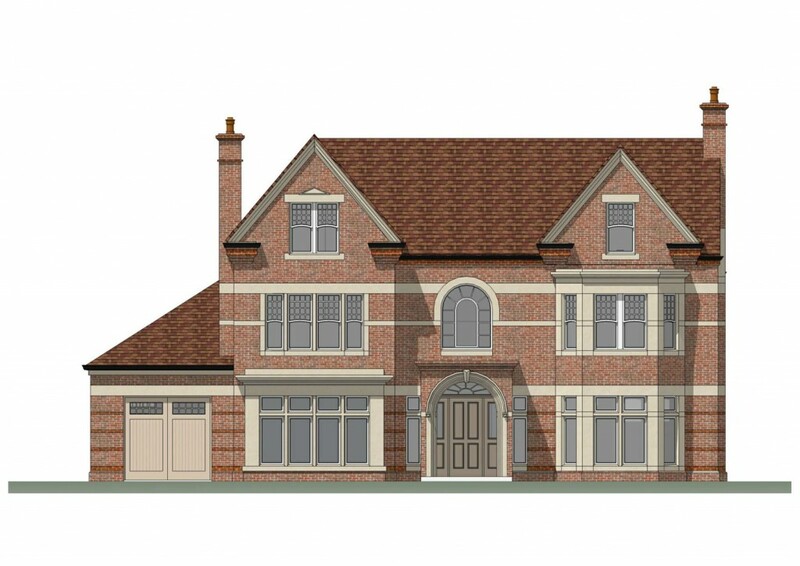 The planning process to achieve permission for this scale of replacement dwelling extended over two years and required two planning applications, given its sensitive location. The planning authority is generally against new development on this main avenue, as it is located within a Conservation Area. This resulted in the professionals in charge having to demonstrate that their proposed replacement dwelling was of greater quality than the building it would replace. 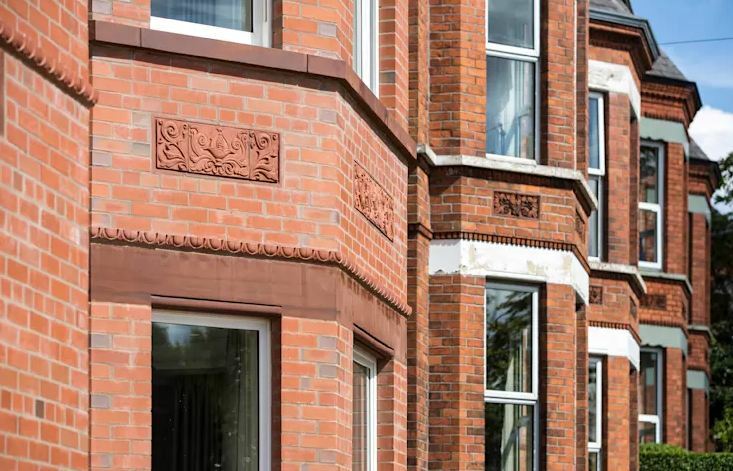 This was achieved by having discussions, presenting 3D models to show the new building fitting into its setting, and by ensuring that they detailed the external brickwork to match neighbouring properties as closely as possible. 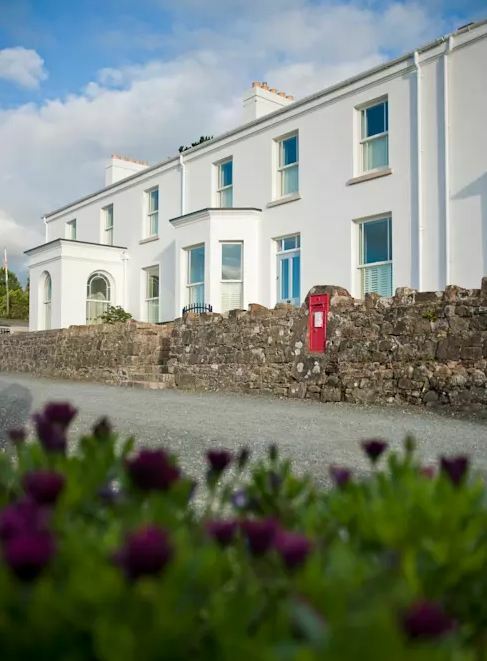 The pretty-as-a-picture dwelling, in all its classic-style glory, flaunts quite a number of eye-catching touches, including the pitched roofing, warm-hued walls, the fabulously textured façade and some bay windows for extra charm. And let’s not forget the delightful garden touches adding even more visual appeal to the house’s front side. 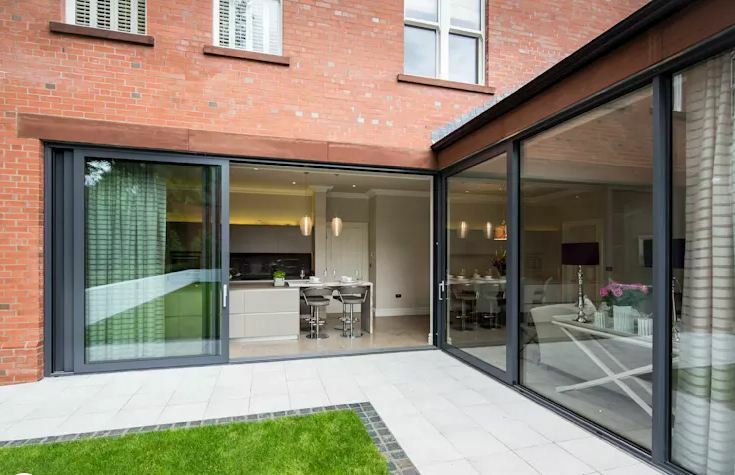 Things take a more modern turn (style-wise, at least) on the inside, especially here in the kitchen that becomes visually one with the beautifully crafted garden, thanks to generous glass sliding doors blending the two areas. And speaking of gardens, how dream-like is this exterior space with its plants, stone flooring, bench designs and host of other equally impressive touches? The ideal spot to host a fabulous get-together with friends, or just enjoy a spot of tea by yourself. 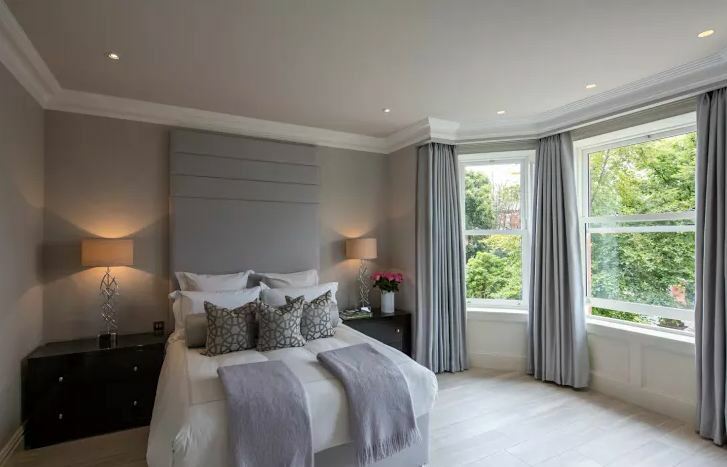 We knew even from the outside that the rooms presenting those bay windows would be most charming indeed – and we are not disappointed at all by this bedroom! Flaunting a soft-grey colour palette, the bedroom’s charms are enhanced even further thanks to the abundance of plush fabrics adorning not only the bed, but also the window treatment! Let’s enjoy a few more high-quality images, shall we? 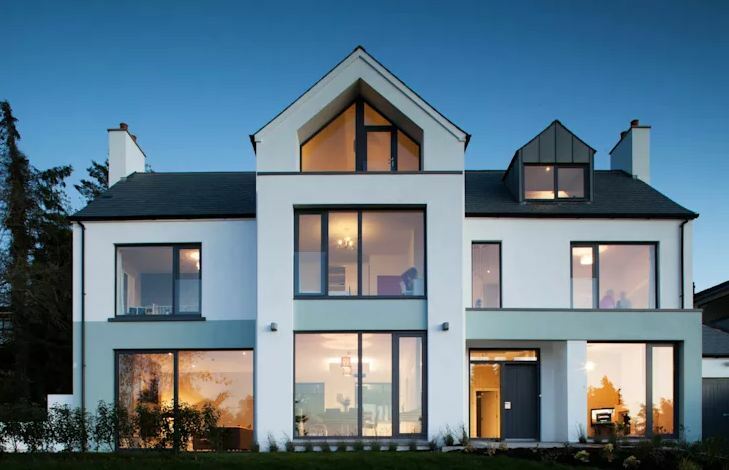 Our latest homify 360° gem comes to us from London team Des Ewing Residential Architects. The project that they’ve agreed to share with us? 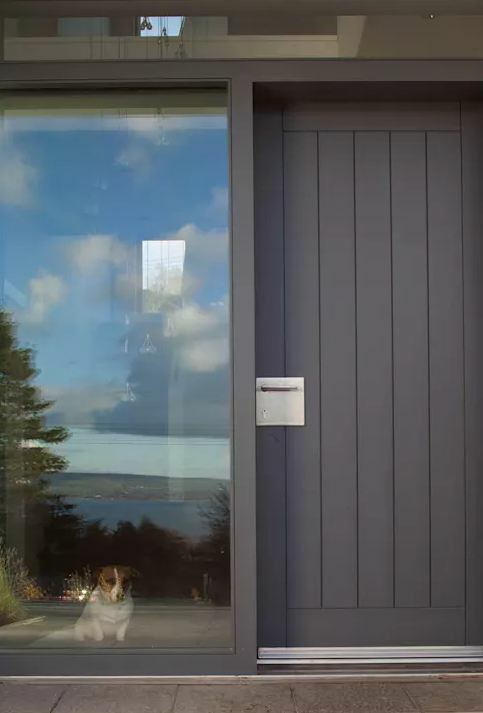 A new dwelling added to a row of fisherman’s cottages – something a little bit different than what we usually have here on homify, right? 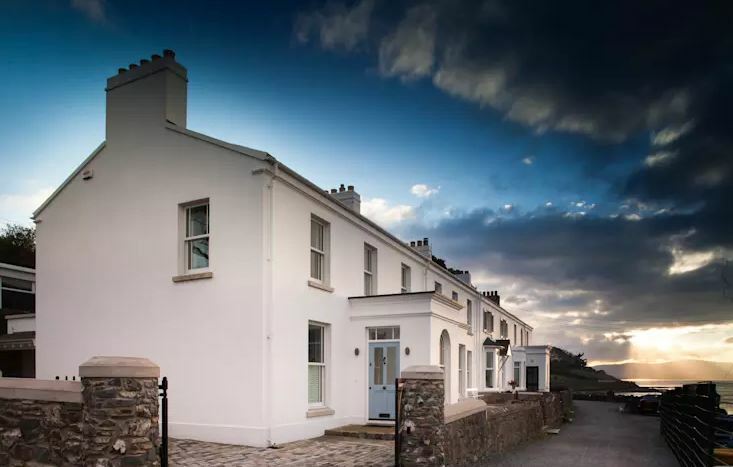 This project was started because the existing end terrace of a row of fishermen’s cottages had been unsympathetically modified over the years and had fallen into poor repair. Planning permission was obtained for a single replacement dwelling which, on initial appearance, seems to be two cottages. By continuing the rhythm of the original row, the enlarged dwelling blends with its original neighbours and is an improvement to this Area of Townscape Character. The dwelling’s exposed location necessitates clipped eaves, bush hammered granite cills, and aluminium-clad sliding sash windows. The front terrace and parking areas are finished in York stone and basalt cobbles. There is no exposed timber except for the heavy hardwood front door, which has been turned 90° to provide shelter from the prevailing winds. 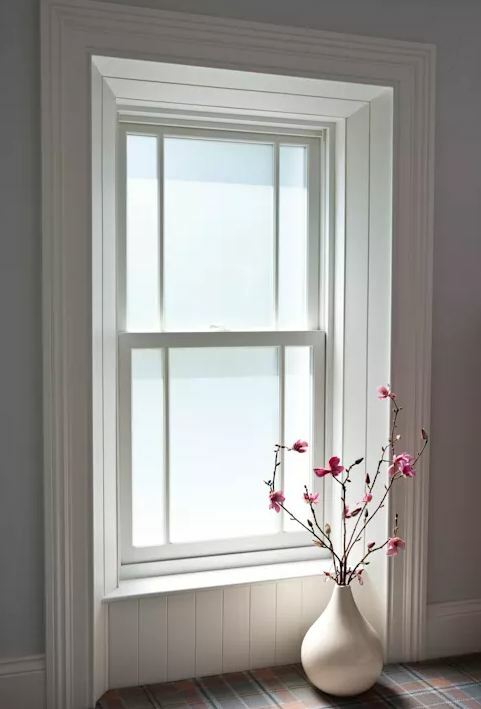 Upon entering we can immediately start appreciating the abundance of natural lighting that seeps indoors, not to mention the beautiful views. The cottages overlook the boatyard and the sea beyond. 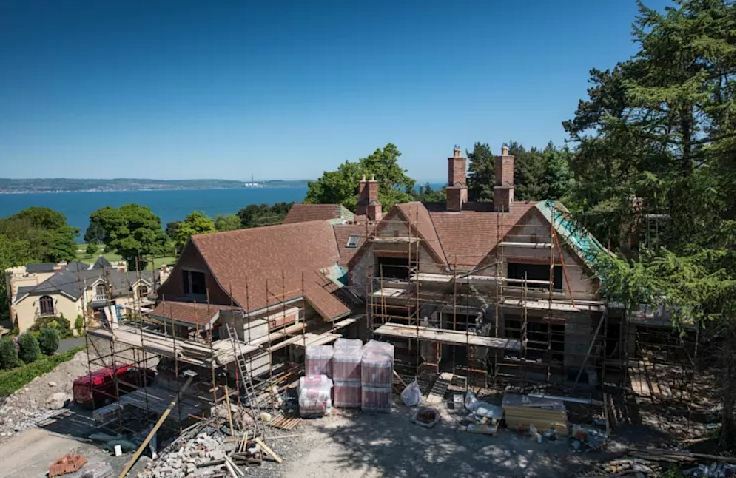 And although the main kitchen/living/dining areas also have sea views, they are private from the coastal path that passes in front of the house. 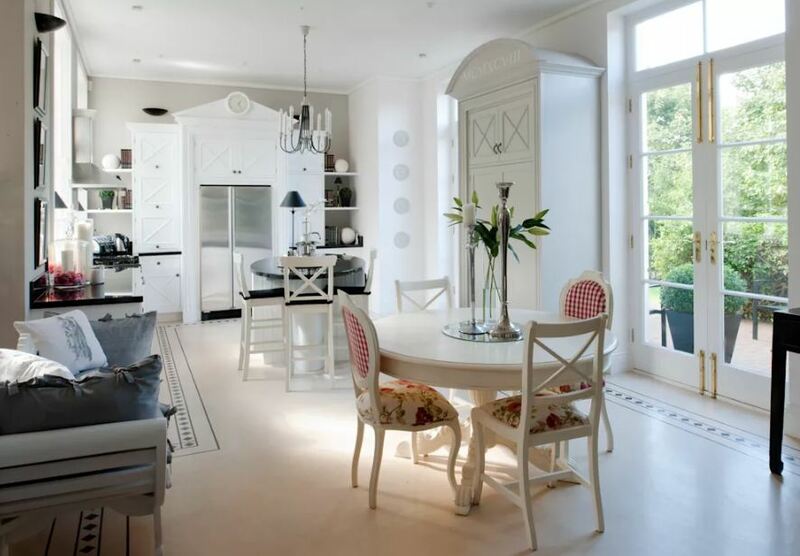 French doors open onto a sheltered patio at the rear that catches the sun until late in the day. 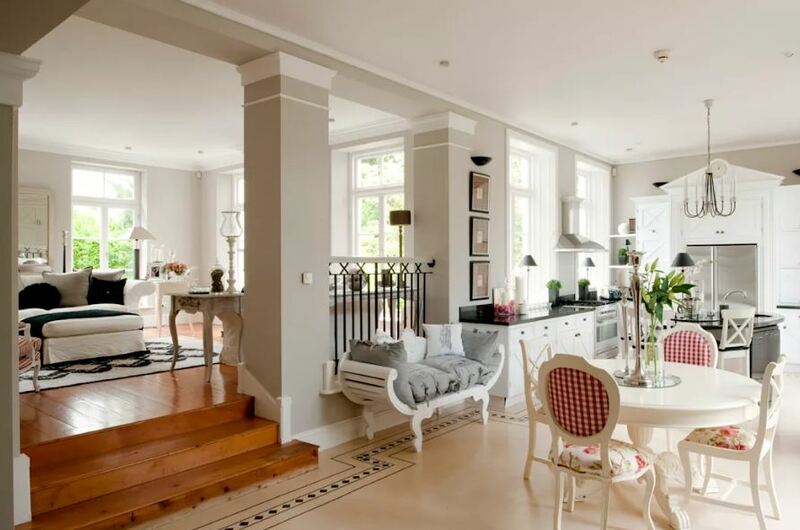 And here we can see the freshness that filters indoors and spreads around the entire open-plan layout, including that delightfully styled kitchen around the corner. 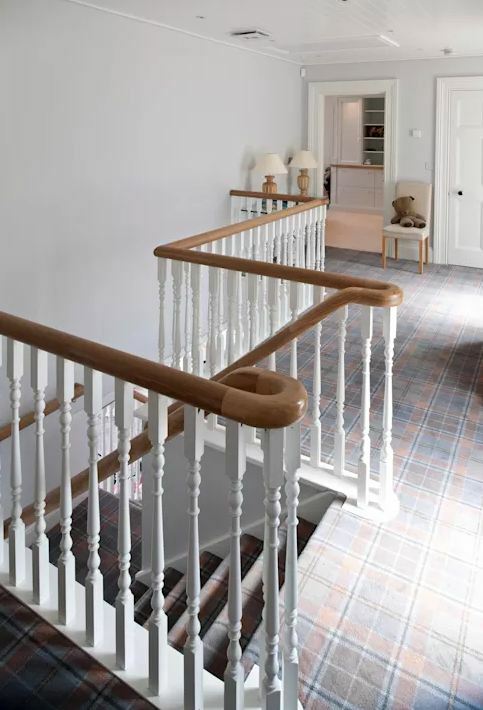 We just love the patterned carpet that not only adorns the staircase, but also adds a decent amount of colour and motif to the top floor areas – so much so that additional décor pieces aren’t even required! 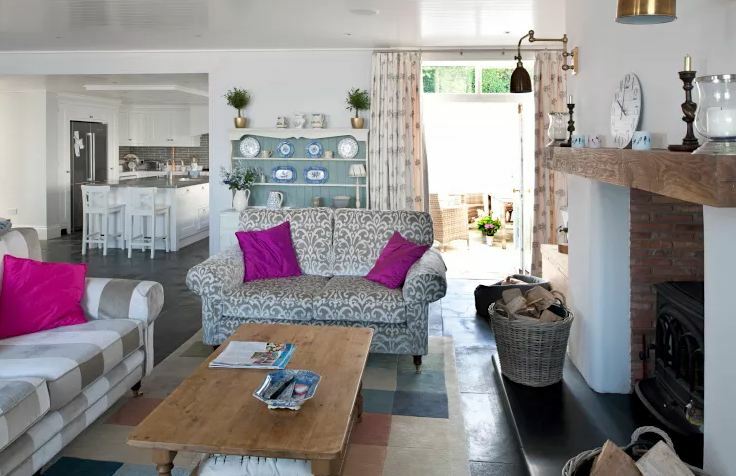 Shall we scope out a few more images of this charming sea-facing home? 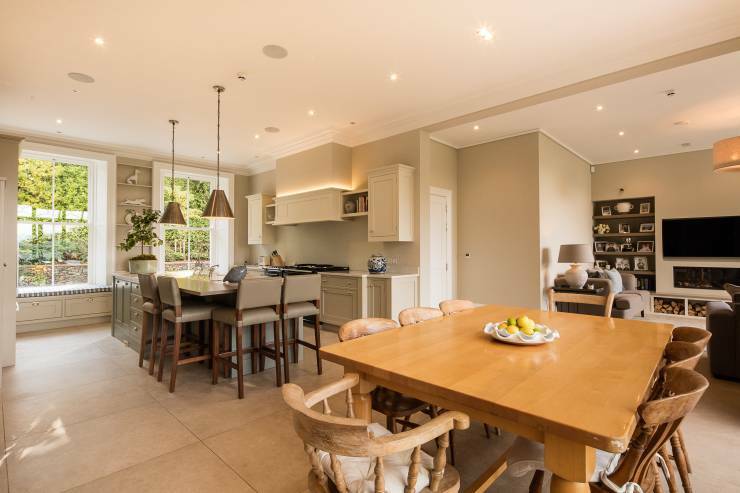 Location, location, location – that saying certainly rings true when it comes to property, and today’s little discovery once again proves that. The project? 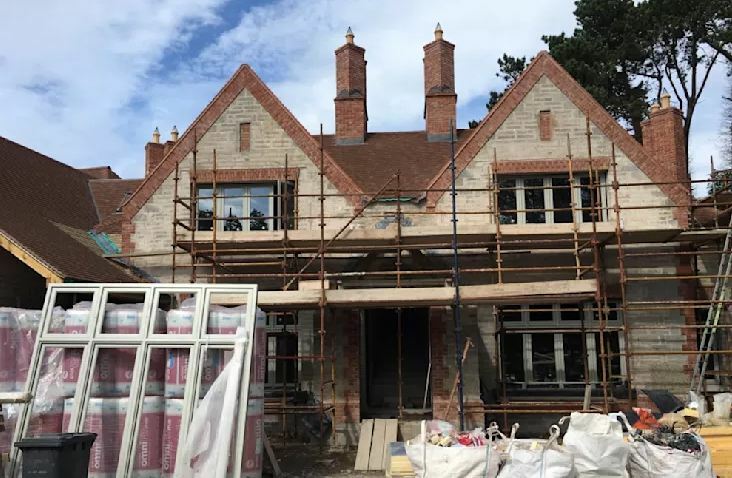 The creation of a traditional Arts and Crafts-style home for clients who, after living in modern houses for several years, decided to build much more character into their new home. 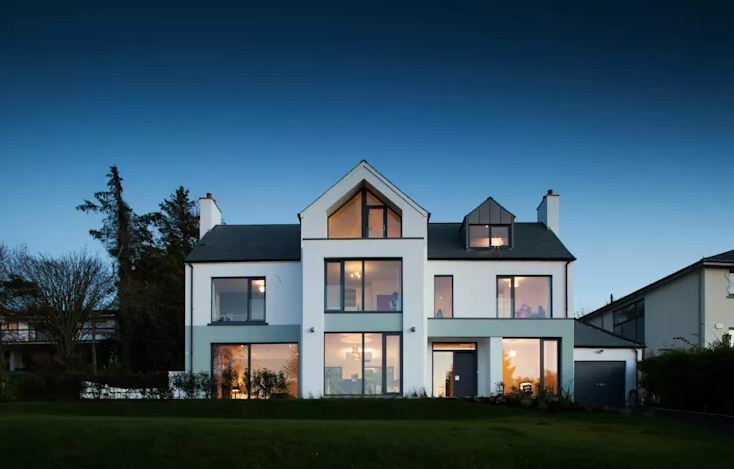 Thus, enter the professionals over at Des Ewing Residential Architects and task them to create something traditional, yet at the same time take advantage of some more modern and simple lines. 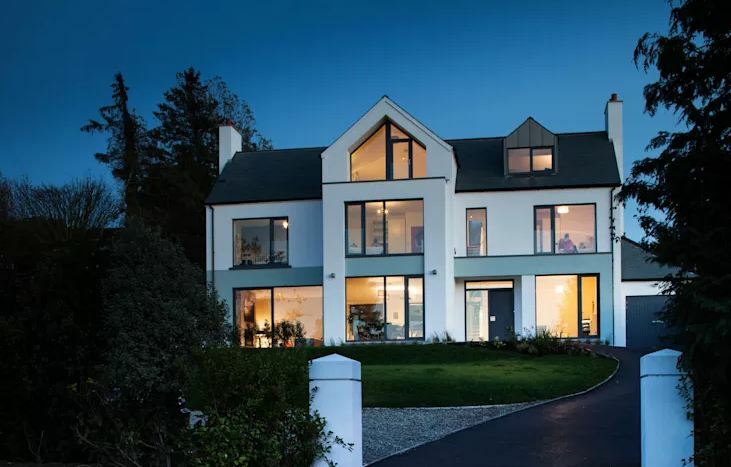 As we can see, it’s all systems go for the conjuring of this stunning new family home. And even though it’s not complete yet, it doesn’t take a clairvoyant to see the traditional look of the house-to-be. 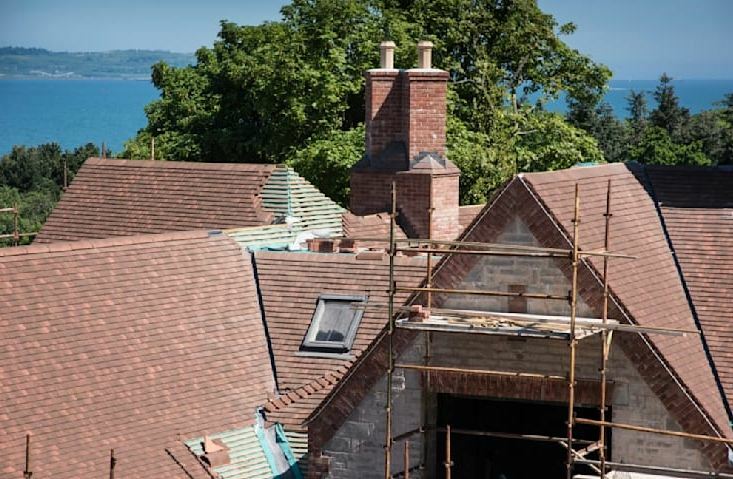 As many natural materials were used as possible, including cobbles, handmade roof tiles, lime render, and timber flooring. Shifting our perspective ever so slightly allows us a fantastic look at that even more fantastic view. How strikingly do the greens and blues of Mother Nature complement the neutral and earthy tones of the traditional house? 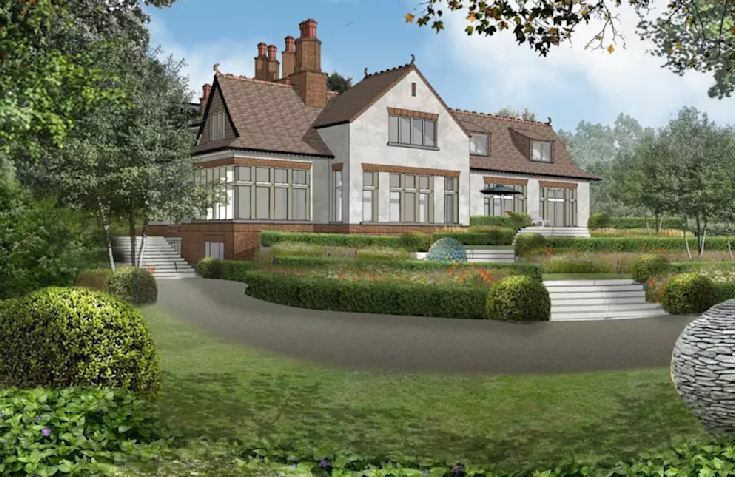 We might not be psychic, but we have extremely professional contacts, and they’ve provided us with a futuristic vision of what the finished house will look like – thus, feast your eyes on this 3D rendering! Don’t you think it looks like a house straight out of a fairytale? As we can see (and heard from the designers in charge), this house majors more on taste and style than glamour. As you walk around it, each corner will provide you with an interesting and surprising perspective. The rear of the house is equally enticing, providing both a royal and lush look thanks to the expertly-made house and the dream-like garden surrounding it. Let’s have a look at some more images, shall we? This discovery reminds us of another little gem we recently encountered: England’s smallest castle. 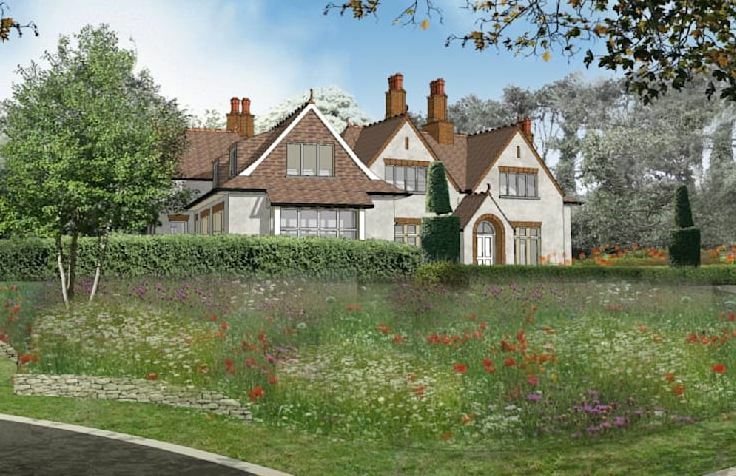 Works starts on site for one of our projects in Loughton, Essex. 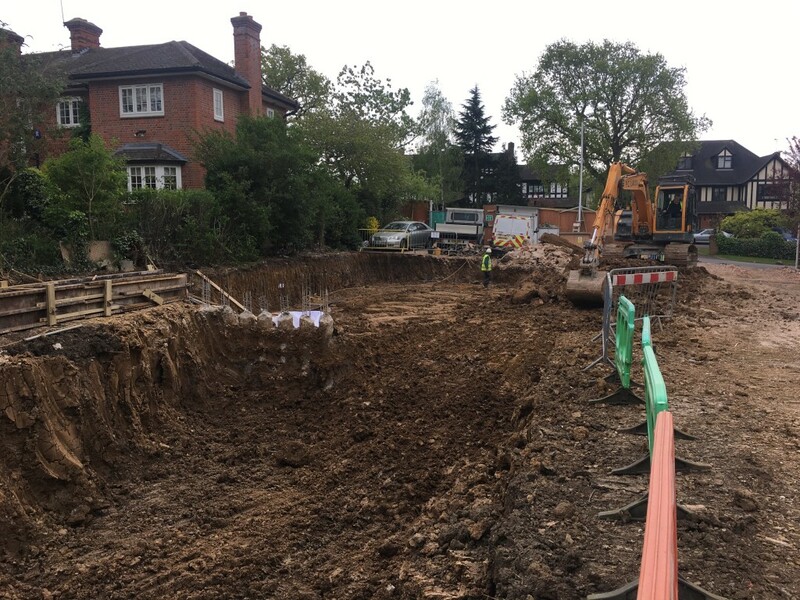 Excavation and building works have just got underway for the foundations. 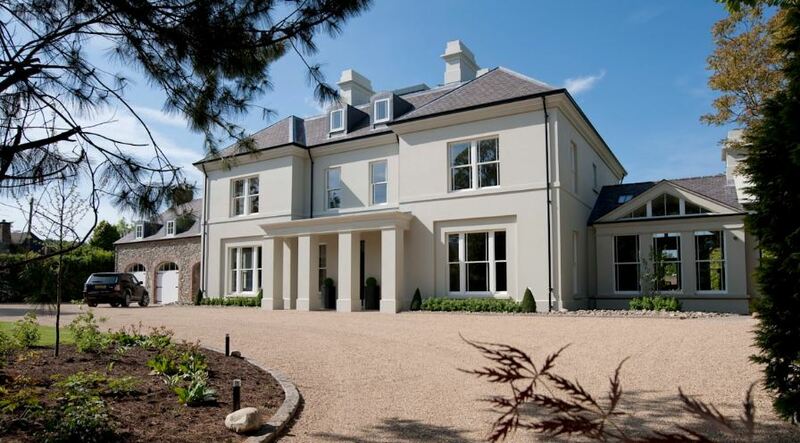 In many new housing developments you regularly see houses built in a classical way. 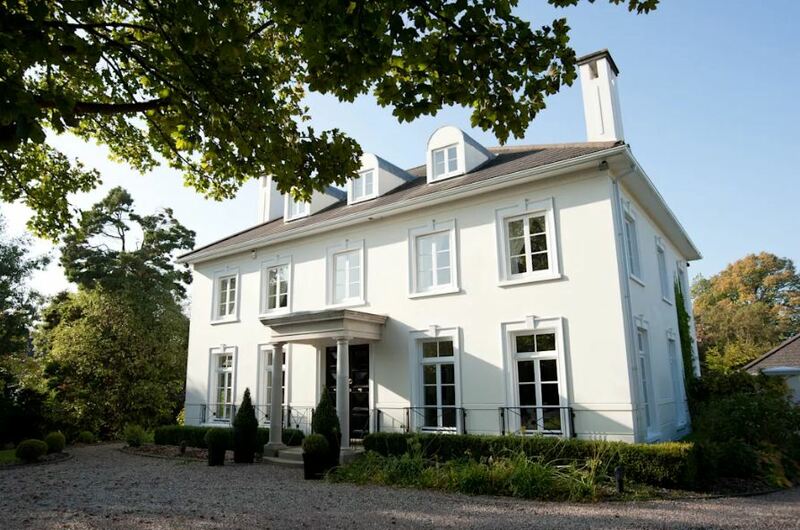 A facade with columns, a symmetrical whole and authentic-looking windows and frames. But often you see that in addition to a healthy dose of classic and often rural inspiration, a modern and contemporary edge even missing. 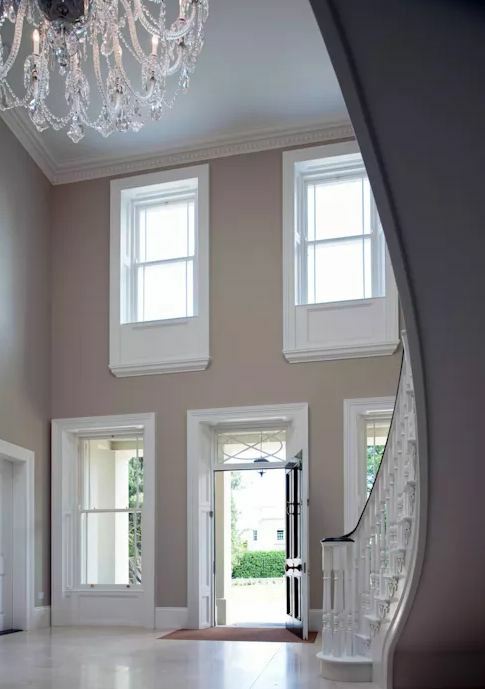 The London Architects from Des Ewing Residential Architects have created such a design and we can go and see the very fine performance of their work. For anyone who wants to build such a house, an ideal source of inspiration. In veel nieuwbouwwijken kom je regelmatig huizen tegen die op een klassieke manier zijn gebouwd. Een voorgevel met zuilen, een symmetrisch geheel en authentiek aandoende ramen en kozijnen. Maar vaak zie je dat naast een flinke dosis klassieke, en vaak ook landelijke inspiratie, een modern en eigentijds randje ook niet ontbreekt. De Londense experts van Des Ewing Residential Architects hebben zo’n ontwerp gemaakt en wij kunnen de zeer fraaie uitvoering van hun werk gaan bekijken. Voor iedereen die graag een dergelijk huis wil laten bouwen, een ideale inspiratiebron. 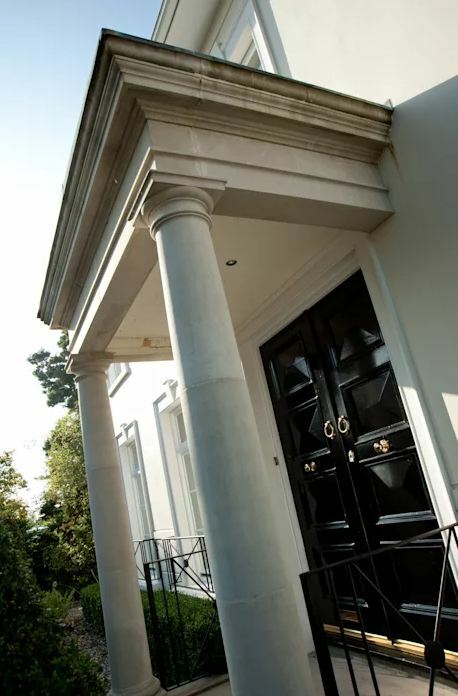 We were all about symmetry in the design of the facade of a classical-inspired home. That symmetry you see is very beautiful here. And the aforementioned columns are not lacking. In addition to a stylish whole, it also makes for a very chic look. A beautiful hanging lantern and two great trees make the reception complete. With such a beautiful front door the rest can hardly more off putting! We hadden het net al over symmetrie in het ontwerp van de voorgevel van een klassiek geïnspireerd huis. Die symmetrie zie je hier heel erg mooi. En ook de genoemde zuilen ontbreken niet. Naast een stijlvol geheel, zorgt het ook voor een hele chique uitstraling. Een mooie hangende lantaarn en twee leuke boompjes maken de ontvangst compleet. En met zo’n mooie voordeur kan de rest ook haast niet meer tegenvallen! This chic you can again see very well here. Furthermore, it is noticeable that this is a very spacious home. A delightful detached entirely in a rural setting. Truly a home to enjoy. But the interior also lets you see all the nice things. Let’s quickly take a look there! Dat chique hebben we net al benoemd en dat kun je hier weer heel erg goed zien. Verder valt ook op dat dit een zeer ruime woning is. Een heerlijk vrijstaand geheel in een landelijke omgeving. Echt een huis om van te genieten. Maar het interieur laat je ook hele leuke dingen zien. Laten we snel daar eens een kijkje nemen! In this fantastic hall you do really go back in time. It seems like you really are in an old house! And that fits very well in this house. After the classic look from the front this will continue magnificent. 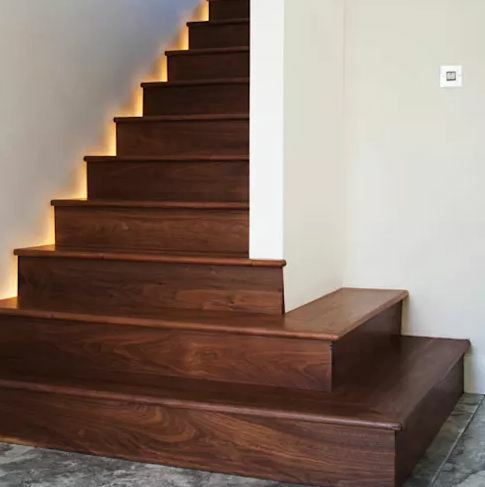 In particular, the staircase is such a wonderful element that you almost start watering. The other furnishings and accessories should also conserves confidence. Deze fantastische hal doet je echt terug gaan in de tijd. Het lijkt net alsof je echt in een oud huis bent! En dat past ook heel erg goed bij deze woning. Na de klassieke uitstraling aan de voorkant wordt dit beeld schitterend voortgezet. Vooral de trap is zo’n prachtig element waar je bijna van begint te watertanden. De andere aankleding en accessoires mogen er trouwens ook gerust zijn. The living room where the kitchen, dining and living room are housed, shows a slightly different picture than you might expect. Though: we had you prepared for a contemporary edge! And you can see here. A rustic whole dotted with some modern touches. Contemporary comfort is paramount. As for the kitchen, we are mainly a fan of the fun bar. What a lovely place to sit. De leefruimte waarin de keuken, eetkamer en een woonkamer zijn ondergebracht, laat een iets ander beeld zien dan je misschien zou verwachten. Alhoewel: we hadden je al op een eigentijds randje voorbereid! En dat zie je hier. Een rustiek geheel met her en der wat moderne trekjes. Hedendaags comfort staat daarbij voorop. En wat de keuken betreft zijn we vooral fan van de leuke bar. Wat een heerlijke plek om lekker te kunnen zitten. 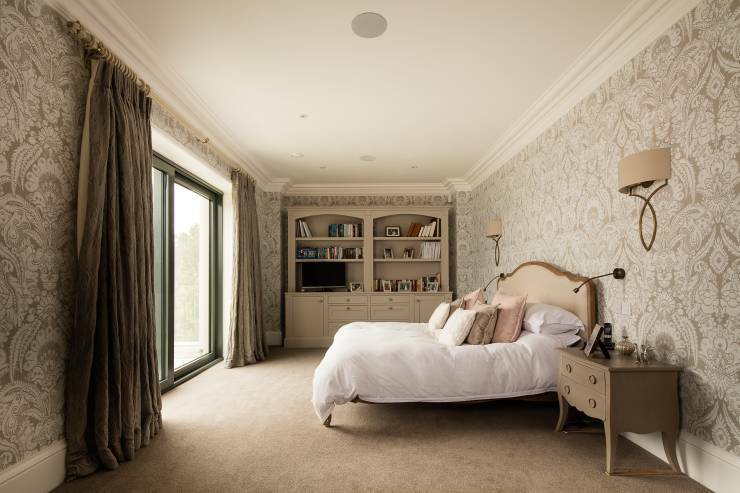 The master bedroom is a great example of an inspiring bedroom. The classic splash here and there. Especially the lovely side tables show that here is working with a lot of details. But some subtle modern elements, such as lamps and the sliding door to the outside, leave again the contemporary come forward. De ‘master bedroom’ is een prachtig voorbeeld van een inspirerende slaapkamer. Het klassieke spat hier weer bijna van het scherm af. Vooral de mooie lijsten aan het plafond laten zien dat hier met heel veel details is gewerkt. Maar wat subtiele moderne elementen, zoals de lampen en de schuifdeur naar buiten, laten ook weer het eigentijdse naar voren komen. Apart from the magnificent ceiling, classic in the nursery is omitted. And that is of course also because it must be above all a welcoming place. 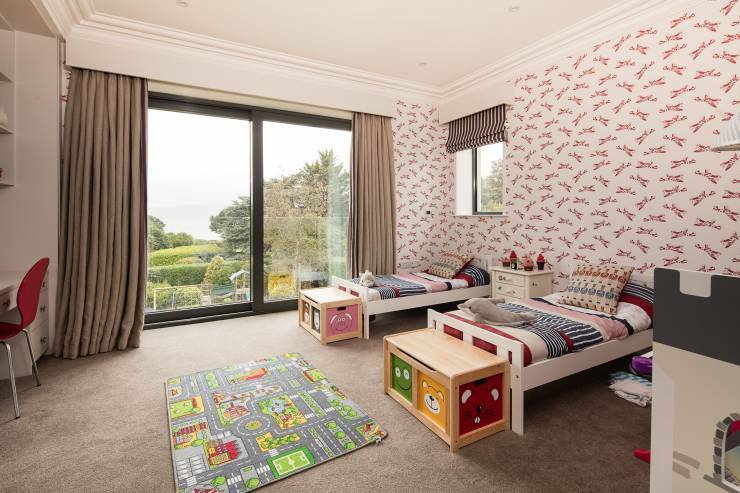 Primarily a place for the kids to be able to rest well, but also the ideal children’s play area.. You bet that the children like to use this fun room. Afgezien van het prachtige plafond, is het klassieke in de kinderkamer achterwege gelaten. En dat mag natuurlijk ook wel, want dit moet vooral een gezellige plek zijn. In de eerste plaats een plek voor de kinderen om goed uit te kunnen rusten, maar daarnaast ook de ideale speelplek. Reken maar dat de kinderen graag gebruik maken van deze leuke kamer. We can not escape to but to continue with terms like fantastic, cosy and inspiring. What this beautiful bathroom yet again you see in the picture? A generous portion classical inspiration contrasts nicely with a modern and sleek glass shower. 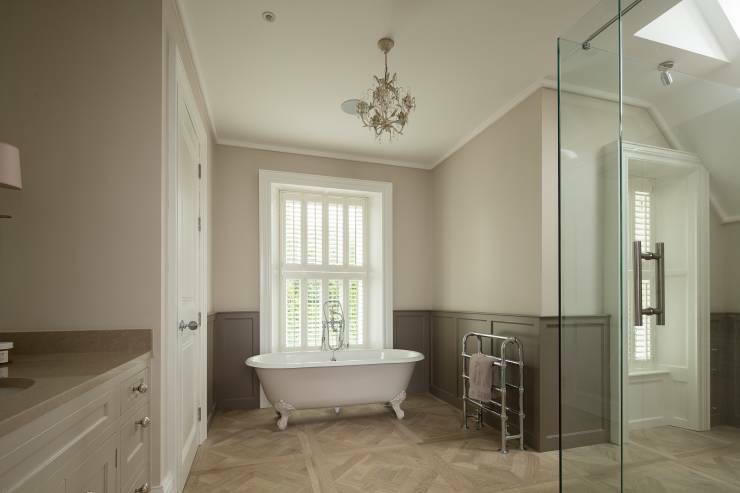 But the roll top bath has to be our favourite. You could spend all day staying in this bathroom. And that goes for the whole house: a wonderful place to live. We ontkomen er niet aan om maar door te blijven gaan met termen als fantastisch, gezellig en inspirerend. Wat deze prachtige badkamer is toch ook weer een plaatje om te zien? Een flinke portie klassieke inspiratie vormt een mooi contrast met een moderne en strakke glazen douchecabine. Maar het bad op pootjes is toch wel onze favoriet. Je zou de hele dag wel in deze badkamer willen blijven. En dat geldt voor het gehele huis: een heerlijke plek om te leven. 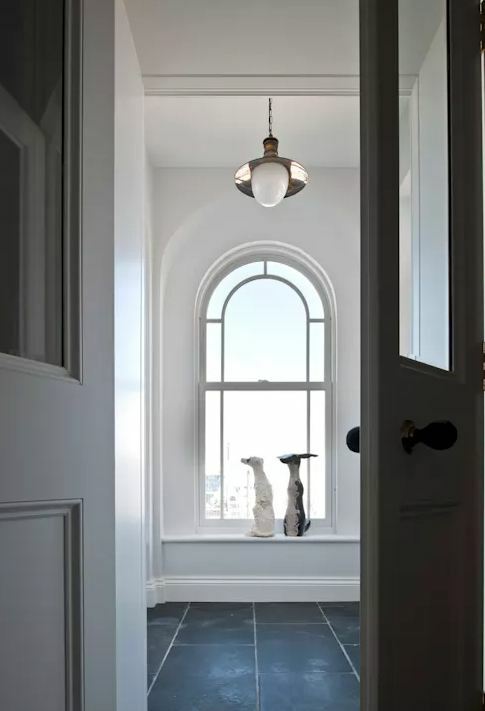 This article was featured on Homify. Written by Johan Van Dijk. Article originally written in Dutch.